Love it or hate it, denim is not going anywhere. Whether you are off for a day of lectures or a lazy day of shopping; date night, drinks with the girls or even work sometimes, denim is the go-to piece that will serve the occasion. As with our classic white T-shirts and knitwear, denim is a staple in our wardrobe that will serve us for years to come. These days, the fashion world is giving the denim obsessed more reasons to rejoice with denim pieces that go beyond the usual bootleg jeans. So what are the top pieces every denim lover should invest in? Well, the following is a list of the top five denim pieces to get your hands on! The playsuit is for the fun-loving, easy going fashionistas and this season, more than just coming in floral patterns or silk materials, we are seeing street style stars wearing playsuits in denim material. Perfect to pair with white sneakers and a messy bun, a denim playsuit is a great alternative to the shorts and T-shirt combo. If you love your short shorts, then don’t change your style formula. Denim shorts have been around for years and they are not going anywhere. Whether paired with a sleek tank top and converse sneakers or worn with a statement blouse and pretty ballet pumps, these short shorts will take you anywhere from the beach to the bar. Studies have shown the damage skinny jeans may cause to our health but that hasn’t stopped most women from wearing skinny jeans during winter and summer. Find the silhouette that accentuates your body shape. You can play with colored denim here or even go for a skinny jean that is torn on the thighs and knees for an edgy touch to your everyday look. For a while there, the denim jacket was given a back seat but this season, denim jackets are back again and being worn with everything from luxury gowns to leggings; tight midi dresses and long maxi skirts. Perfect for those chilly summer nights, the denim jacket in a classic blue hue or in a summer white is a great piece to work in your everyday style and the best part of this is that the older the jacket is, the better it looks. When it’s loose fitting, casual cool that you are going for, then the boyfriend jean is the denim piece you have to get your hands on. The antithesis of the skinny jeans, the boyfriend jean is comfortable in that it gives your legs room to breathe. 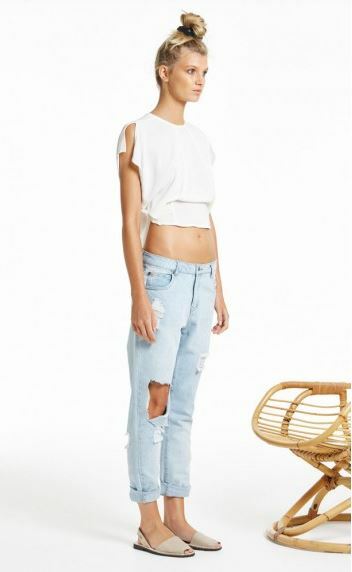 The boyfriend jean can be worn with sneakers and an elegant tank top for a super casual look or it can be given a chic twist when worn with a great pair of statement heels and a silk lace camisole. These are the top five denim pieces you should own right now. Which one can’t you wait to get your hands on? Share your thoughts below!